The firecrackers call in early afternoon to announce that something spectacular was about to happen in the village later that day. It’s filled with surprises here. 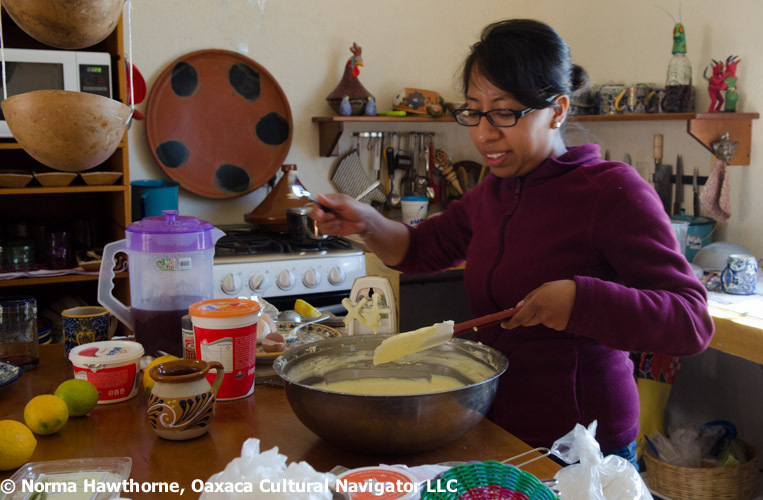 My neighbor Ernestina comes over in the morning to offer me 20 fresh, creamy chicken and mole amarillo tamales for 100 pesos. 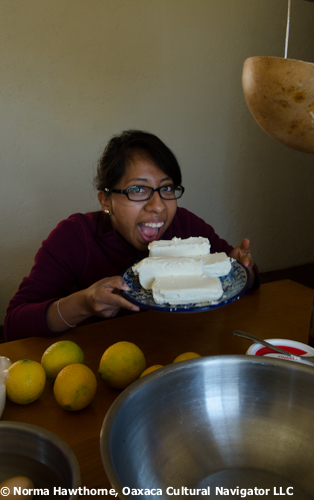 Then, later tamales are served for lunch at the guest house where the felt fashion workshop participants assemble. 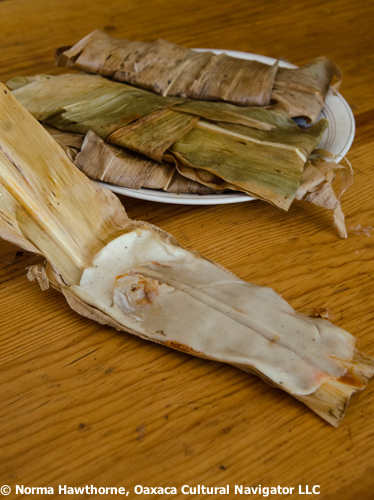 It is not yet Dia de la Candelaria, when everyone eats tamales. What is going on? I wonder. 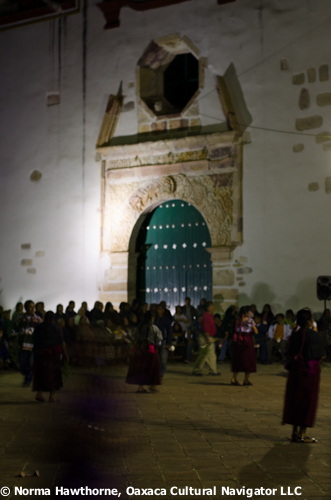 At six-thirty, the young men atop the bell tower ring the church bells. Rosario and Josefina say goodbye. Where are you going? A la iglesia. To the church, they say. 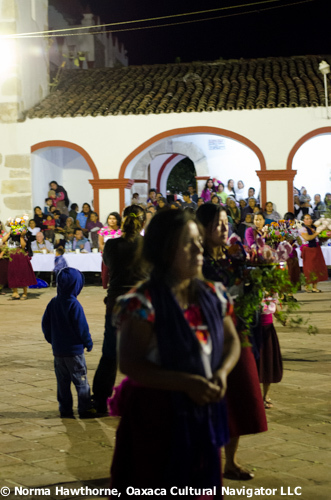 There’s a fiesta to welcome 30 visiting priests from Columbia, China, Nueva York (New York), California and India. I follow the sound of the bells to the church courtyard. Nearly the entire village gathers. 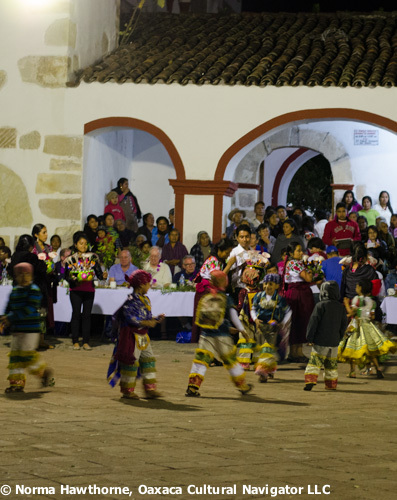 I arrive just in time to be offered a fresh, steaming hot tamale, to see the children dressed in Dance of the Feather plumage dancing the re-enactment of the conquest, to hear the band play, and to see banquet tables filled with men who sip hot chocolate and eat tamales, served by traditionally dressed village women. 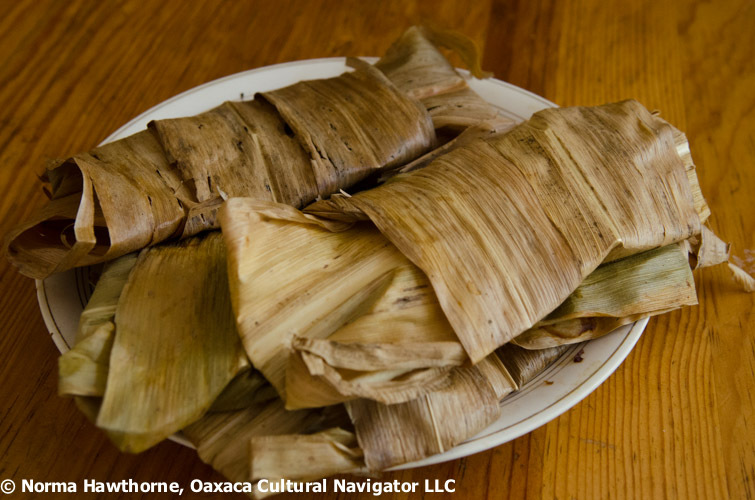 I hear that more than a thousand tamales are made that day by the women chosen to the traditional, pre-Hispance Jarabe del Valle dance. They are part of the church committee that supports the village festivals. 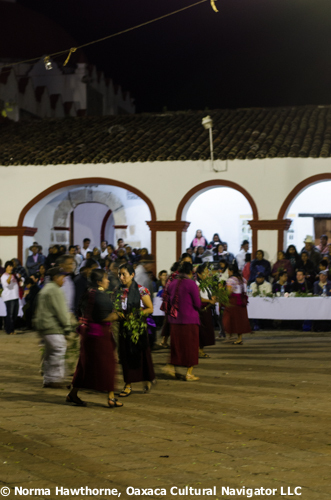 A master’s of ceremonies talks about cultural exchange, the many Zapotecs from this village who live and work and practice their traditions in towns throughout southern California, and how these priests help people to adapt, acclimate and stay connected to their roots. 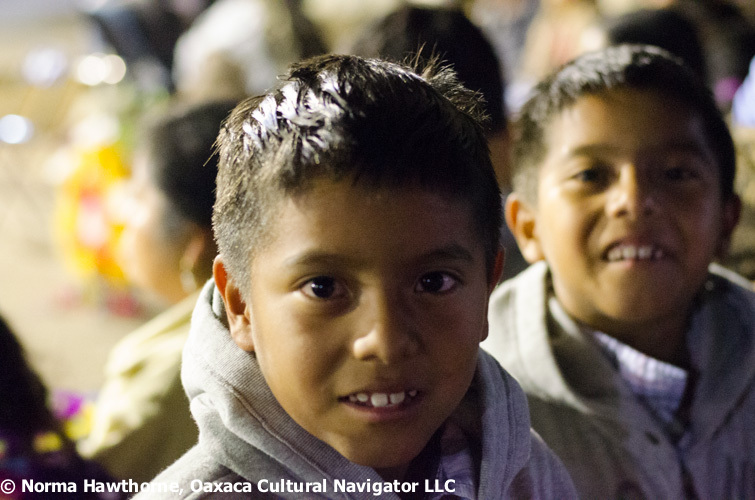 The Spanish is sprinkled with a little English to make the visitors more welcome. 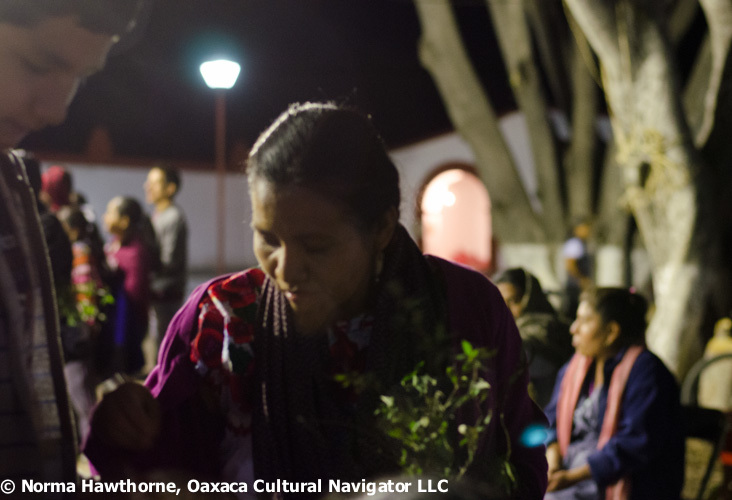 Then, the women, holding branches of fragrant herbs welcome the guests to join them for the Jarabe del Valle. 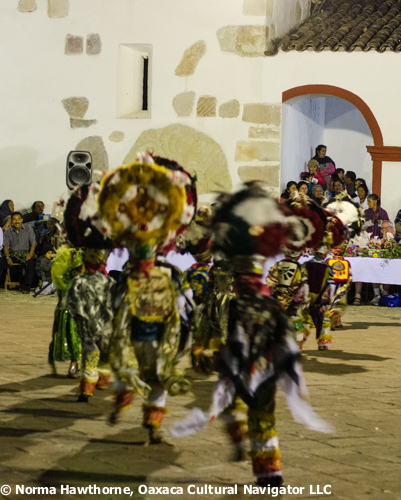 The men, towering above them, move their feet to the rhythm of the dance and catch on quickly. 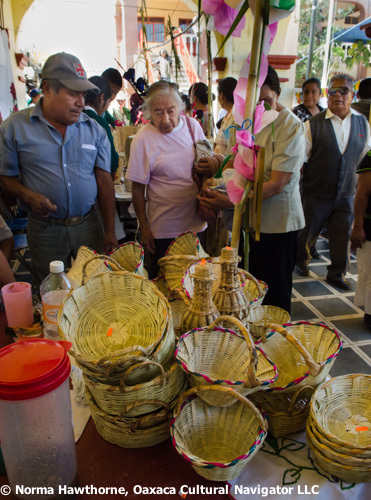 Today was the first of two Sundays when the Zapotec village of San Juan Guelavia holds its annual basket fair. Next Sunday, February 2, is the last day. They open in the compact zocalo at 9 a.m. By the time we got there, close to noon, there wasn’t much left. Before I could say basket, two that caught my eye were snatched up from under my outstretched arm. 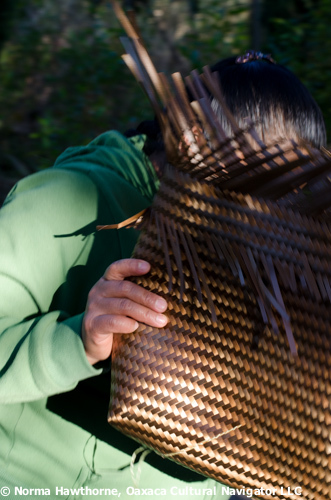 The bamboo used to make the baskets is picked young and green, much easier to manipulate. Then, it is washed and stripped. 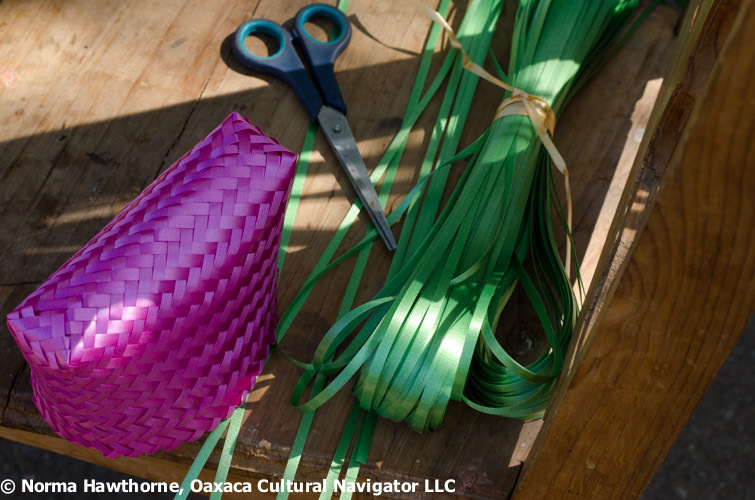 After the basket is complete, the sturdy handles are wrapped with palm leaves. 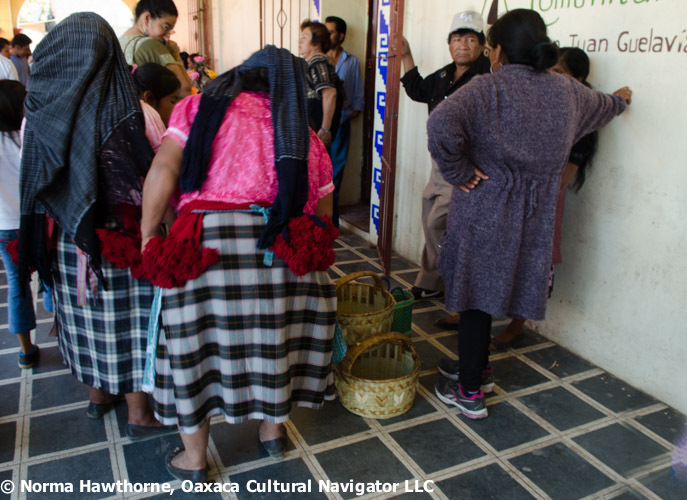 Most of the Zapotec women in the central valleys of Oaxaca prefer these baskets for daily shopping use. The handle fits easily over the crook of the elbow, is smooth and comfortable. 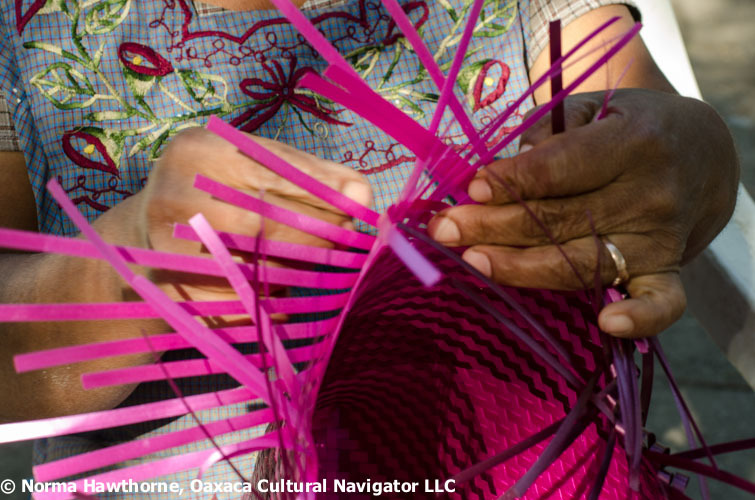 Both men and women are basket weavers. 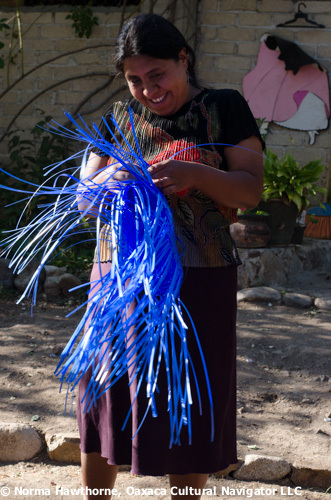 They are also makers of corn husk flowers, lamp shades, bird cages, decorative woven bottle coverings, and traditional storage baskets for maize. 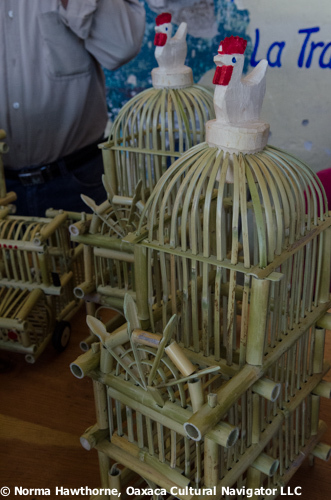 Some of the workmanship is so fine, one wonders how fingers can weave the course strips of bamboo, let alone strip the cane and prepare it for the weaving process. 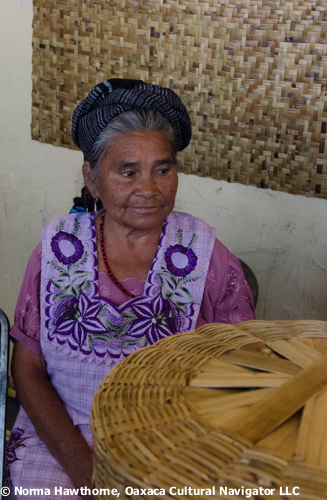 The basket I bought is above, left, held by the weaver who made it. 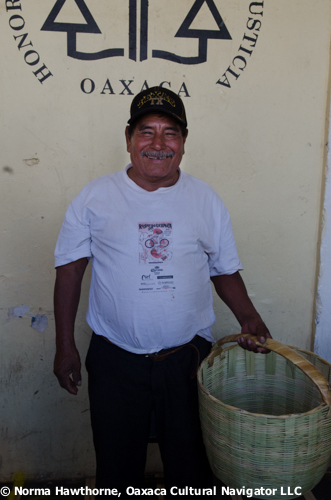 He was happy and so was I.
Basketmaking in San Juan Guelavia, Oaxaca is a craft in decline and I have included this link to an academic paper that references San Juan Guelavia and their struggle to keep this craft tradition alive. I hope you get to the Feria (fair) next Sunday. I paid 140 pesos for a beautiful handmade basket, quite large. That’s about $11 USD. 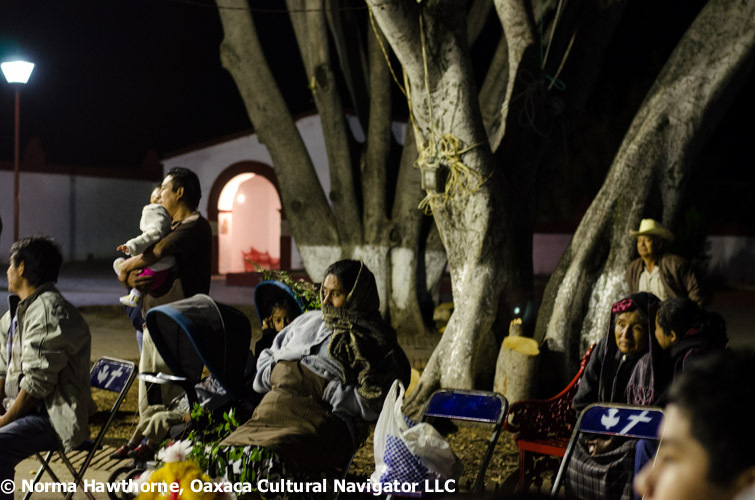 A day’s wage here in Oaxaca. Who knows how long it took to make! Looks like more than a day to me. 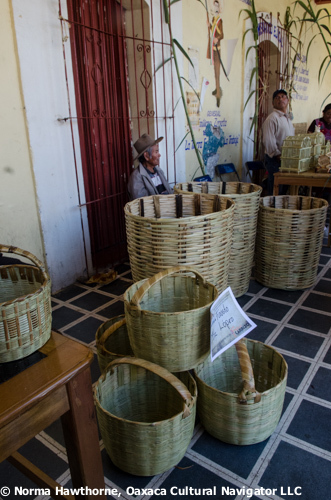 A basket this size for sale at the Tlacolula market would cost double the price, maybe more, and still a bargain at that! 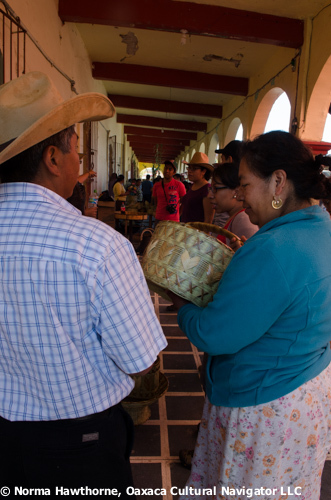 In addition to the baskets, there is lots of home-style cooked food like quesadillas, tamales, and hot steamed corn-on-the-cob. Come and linger. 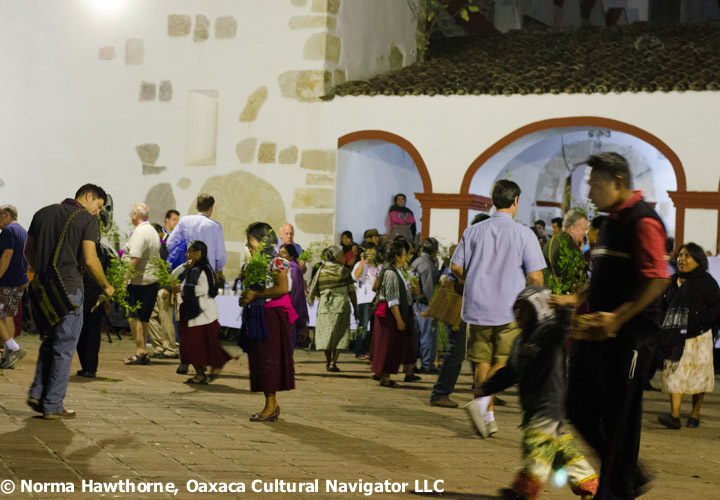 Where to Find San Juan Guelavia: From Oaxaca City, take any bus or colectivo taxi heading to Tlacolula or Mitla. Get off at the San Juan Guelavia crossroads (which is about 1/2 mile before you get to Teotitlan del Valle, and maybe five miles beyond El Tule). 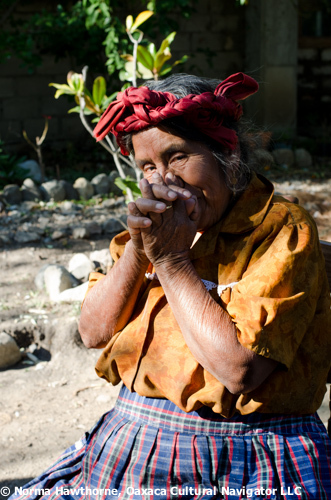 There are village taxis and tuk-tuks that will take you along the beautiful curving road that leads to the village, set about three miles off the Panamerican Highway 190, nestled in the rolling foothills of the Sierra Madre del Sur. 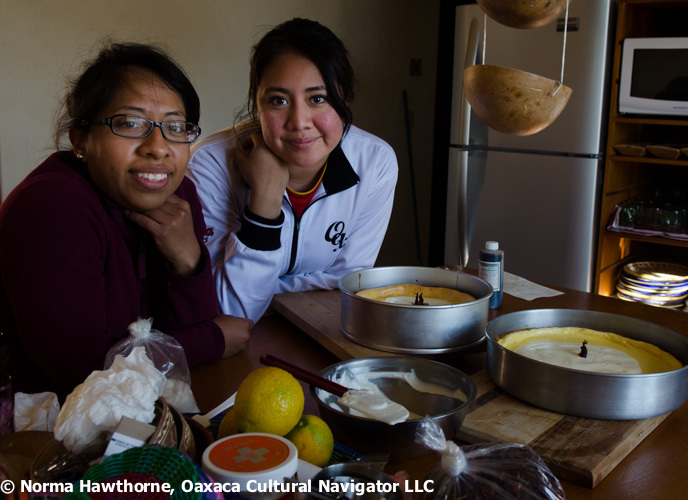 Cheesecake is becoming more popular in Oaxaca, Mexico. 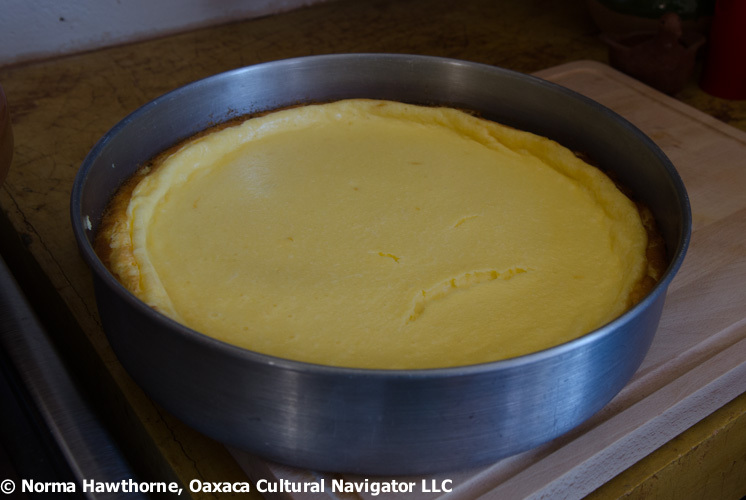 Though it’s difficult to find springform pans here that are used to bake the traditional New York-style cheesecake. I know one store, Pastigel on Calle Rayon near the Periferico that sells pastry baking supplies where you can buy one. Called moldes, they are very expensive, about thirty-five dollars. There are plenty of low-cost aluminum cake pans, though. Line one with buttered parchment paper and it’s easy to improvise. Everyone here loves cake. And, cheese. Requeson. Quesillo. Queso fresco. Cream cheese, known as Philadelphia, can easily be bought but it’s also costly. 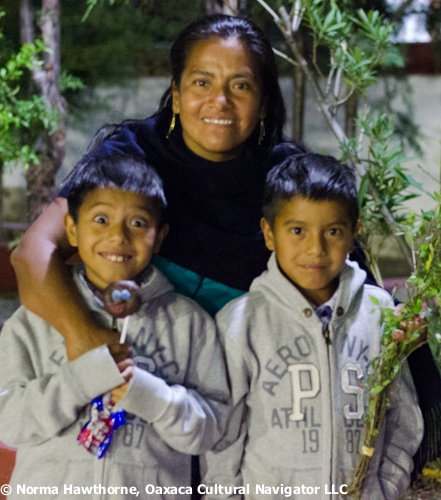 More than two dollars a package at our corner tienda in Teotitlan del Valle. So, we make the best of it and improvise once more. 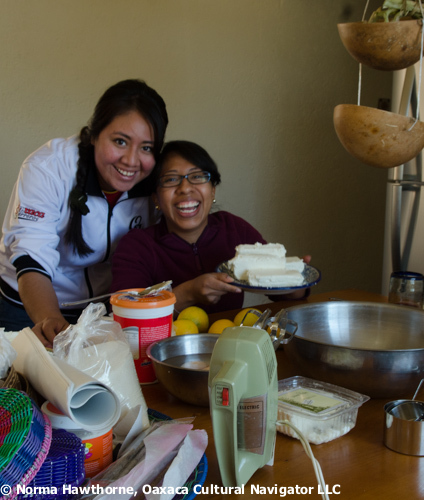 To prepare for our cheesecake cooking class, I gave Janet and Diana a shopping list in advance. 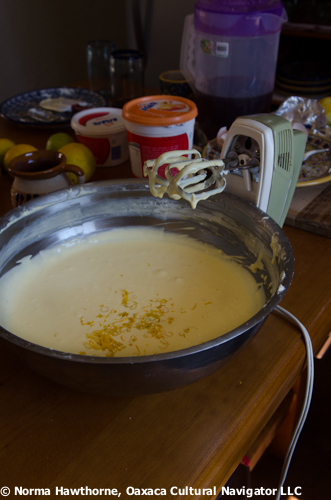 Six eggs, one cup of sugar, real butter, a large container of sour cream, four packages of Philadelphia, and one lemon for each cake. In Spanish, lemons are called limas. That makes me think of Lima, Peru, which I just realize is named for a citrus. Diana arrives with six ripe lemons picked this morning from the tree in her garden. It’s not even February. Janet needed my pan and forgot eggs. I used a deep dish casserole, also buttered, lined with a parchment paper circle partly cut into pie wedges and overlapped. Improvise, I say. We redistributed the thirteen eggs between us, so they used five each. I used three. Another improvisation. I had two packages of Philadelphia, so I added a cup of Requeson and creamed it along with the cheese and sugar. Then, I added one cup of sour cream and reserved the rest for the topping, which we later adorned with a flor de jamaica (hibiscus flower). I told the girls that cooking is more of an art than a science for me. It took us four-and-a-half hours to make and bake three cheesecakes. 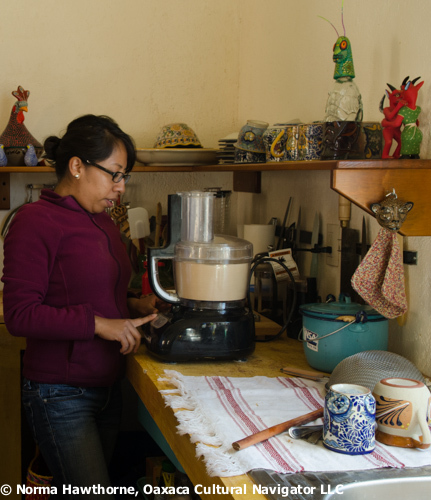 As we prepped, Janet translated the steps into Spanish for her family. Most importantly, we had a lot of fun. Many, many years ago, when I owned a gourmet cooking school and cookware shop in Indiana, I baked and sold whole New York-style cheesecakes for twenty-five dollars, three dollars a slice. I had commercial equipment. Today’s lesson employed a hand-mixer and a food processor (lucky to have them here), which we used to make a cookie crumb crust with Marias instead of graham crackers. We are at six thousand feet altitude, so baking is slow. What usually takes forty-five to sixty minutes in North Carolina is closer to an hour-and-a-half here. I had to bump up the Celsius temperature on my oven to get a cooked cheesecake. Translated here: 400 degrees F. instead of 350. Another improvisation. 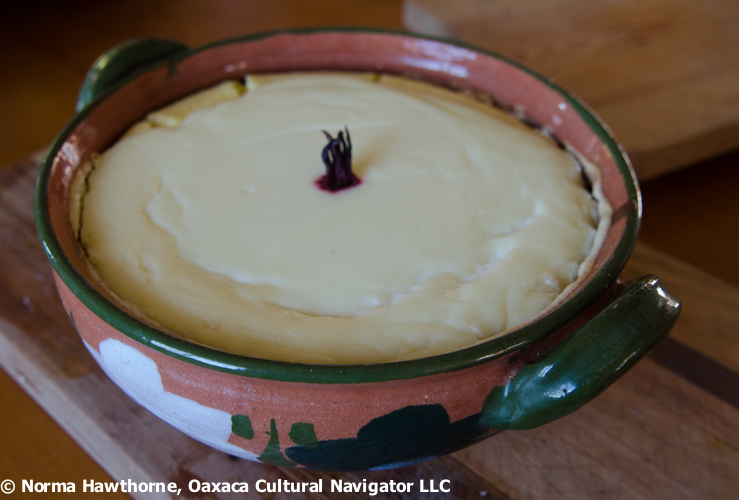 For the Oaxaca Cheesecake Recipe, click here. 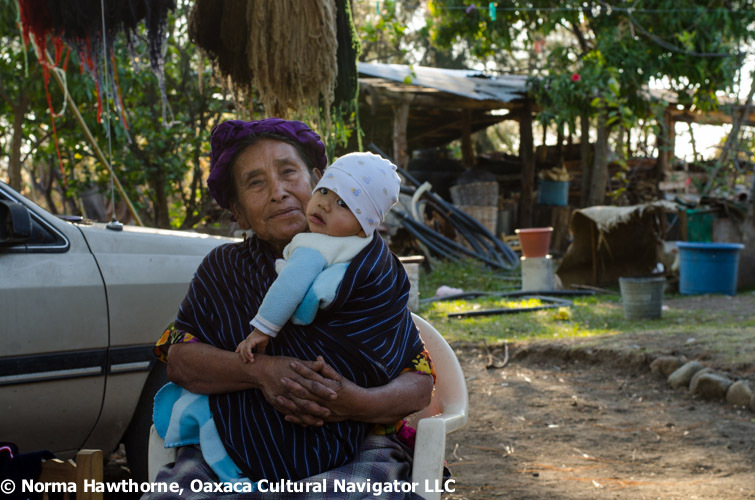 Beyond the stream they call the Rio Grande here, the women gather in a circle around the pine-shaded, packed dirt courtyard outside of Ernestina’s house. 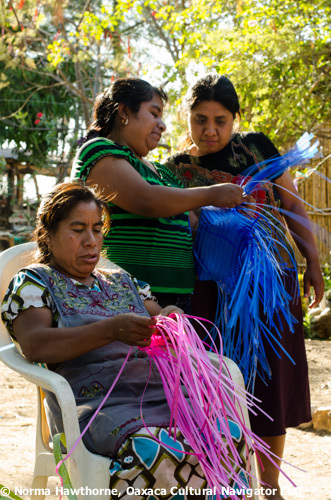 They are learning how to weave with another sort of material, not the usual hand-spun wool that is traditional for Teotitlan del Valle, the famed rug weaving village. They are using brightly colored plastic strips. 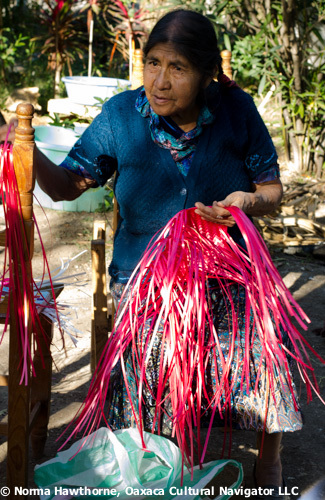 This is palma plastica (plastic palm) says maestra Norma, who came from San Baltazar Guelavila, to teach. This is the new-age derivative of the traditional palm used for centuries by most villagers in this valley to make petate sleeping mats, food and storage containers. 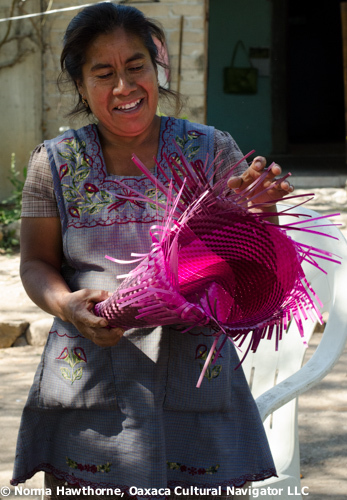 The craft is slowly disappearing and few Oaxaca weavers now produce this traditional folk art. 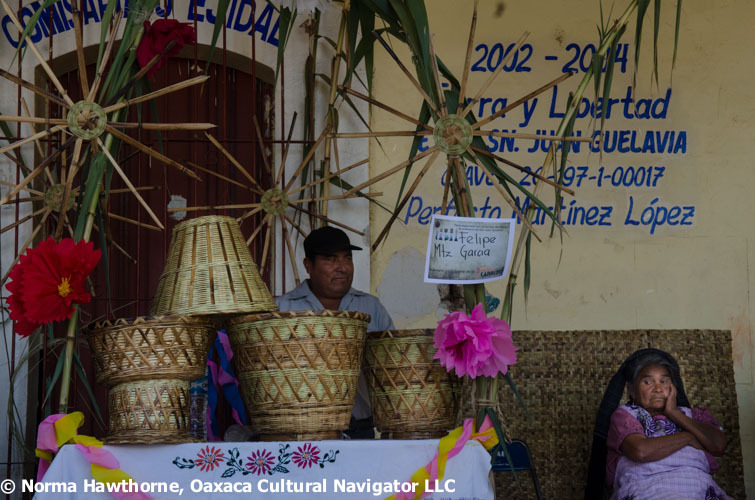 See: Decline of a Craft: Basketmaking in San Juan Guelavia, Oaxaca. The plastic strips will become handbags, coin purses, and placements that can be sold to tourists in the local morning market. Another source of much needed income for women to have their own money, whether they are married or not. 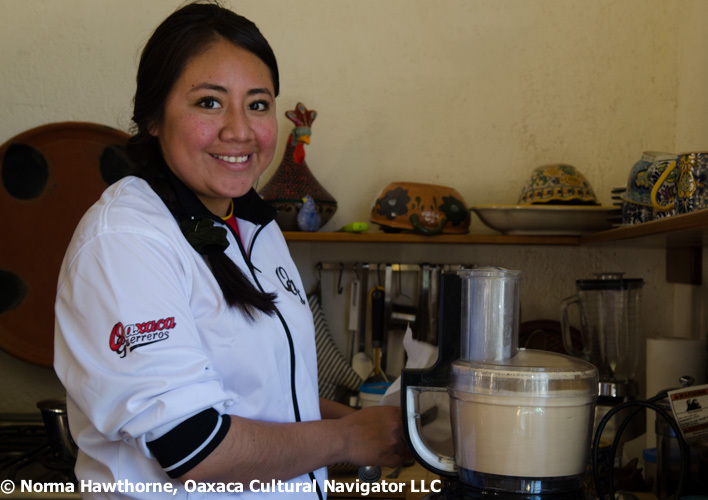 This week’s lesson is an experiment in economic development — how to make a small business. 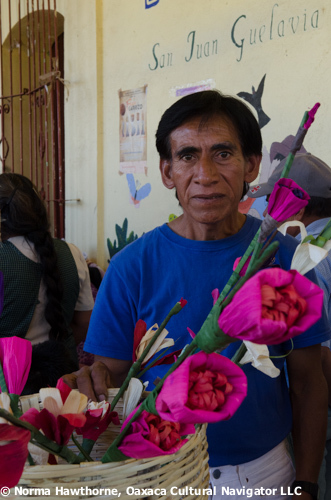 Ernestina organized the multigenerational five-day event and invited friends and relatives to participate. 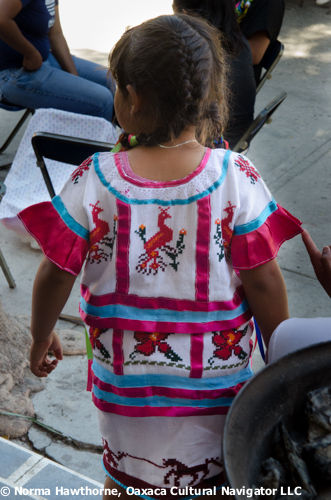 The abuelas — grandmothers — are joined by daughters and granddaughters, nieces and cousins. There is a baby tended to by a grandmother while mom learns. As I walked by Ernestina’s house, I noticed this unusual colorful activity and waved. She invited me to come in to see what they were doing and asked if I would return with my camera to take photos. Of course, I did! 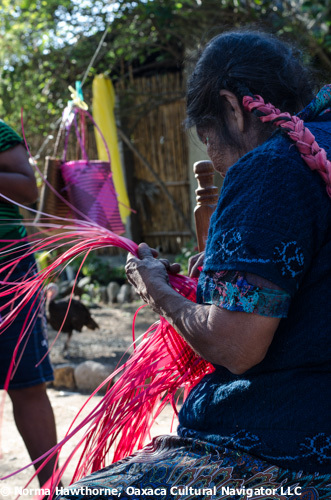 Norma’s town San Baltazar Guelavila, is known for it’s hand-woven baskets and is also an artisanal mescal-producing center. It is in the mountains beyond Santiago Matatlan off the Carretera Internacional 190, otherwise known as the Panamerican Highway, which runs from Alaska through Oaxaca to the tip of South America. 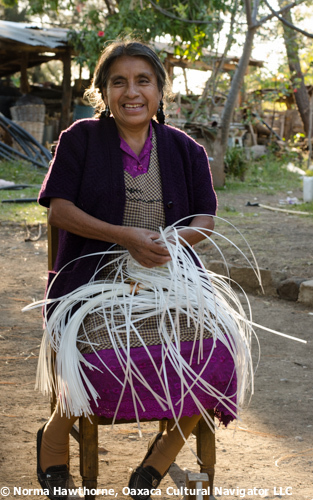 An experienced lifelong basket weaver, Norma told me she can weave three to five baskets a day. She has fast fingers. The beginners were happy to make even three baskets in five days. The baskets will sell for between 100 and 150 pesos each. That’s $7.50 to $12 USD. 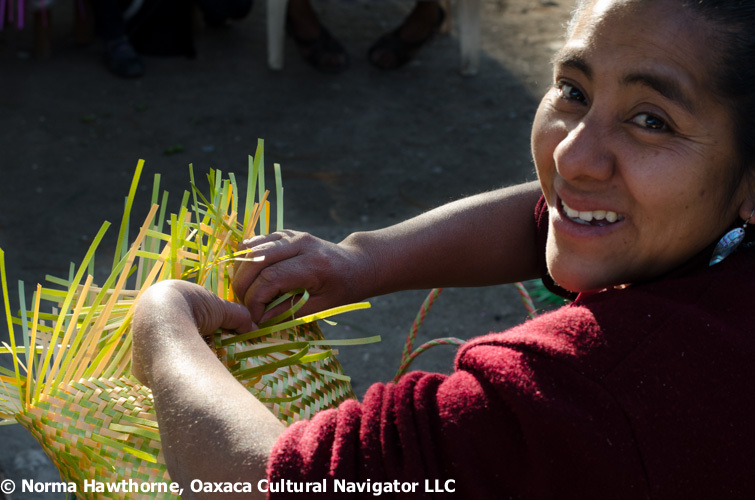 The average working wage in Oaxaca is 100 pesos a day, so the women are happy if they can produce and steadily sell one basket a day! Ernestina hopes so. 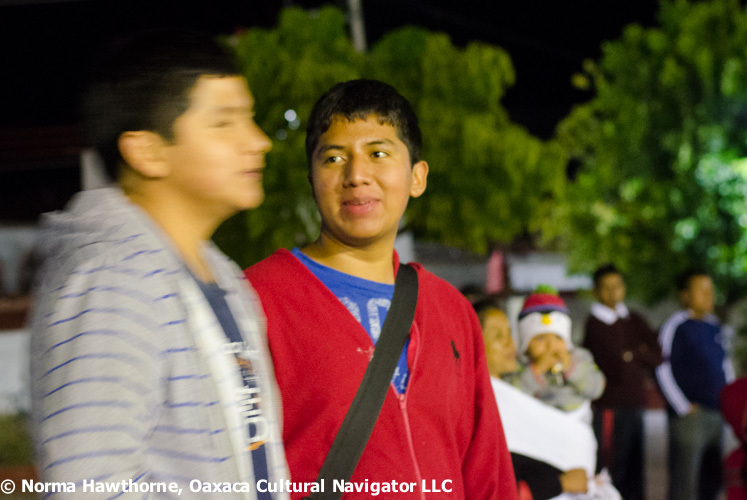 But, of course, that depends on tourists visiting Teotitlan del Valle, and most come via tour buses and not as independent travelers. 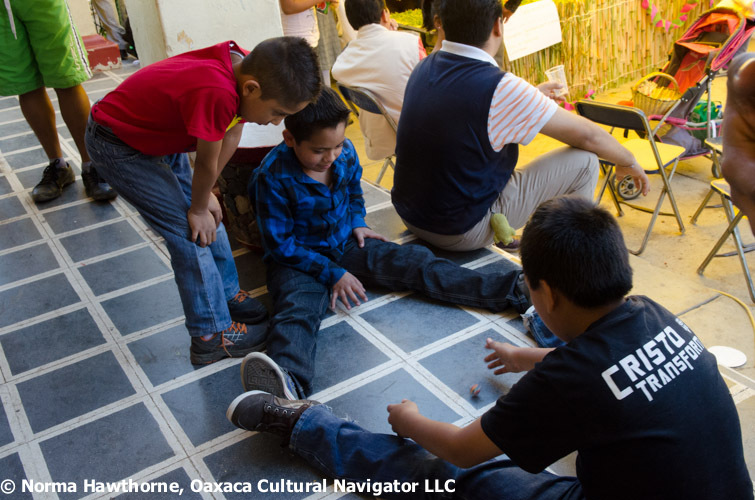 They may stop at a pre-determined rug weaving gallery and then go on to San Pablo Villa de Mitla to see the archeological site or continue on to Santiago Matatlan for a mezcal tasting. They will miss the 9:00-11:00 a.m. daily morning market, which is at the heart of this 6,000 person community. And, miss the opportunity to buy one of these colorful, handmade totes. People here love intense color. The natural materials are giving way to synthetics because of cost and convenience and personal taste. Yet, as I pulled up a chair around the circle and sat a while, I was reminded of my own knitting circle back home in North Carolina and the comfort of good friends. 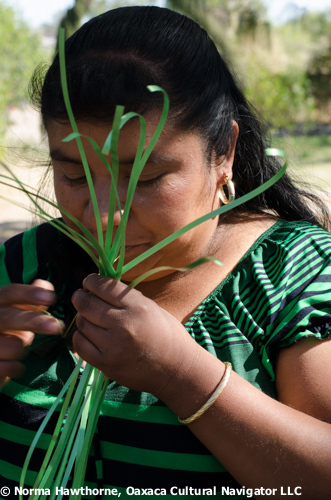 And, the revival of a traditional craft that can make the difference in women’s and children’s lives here. 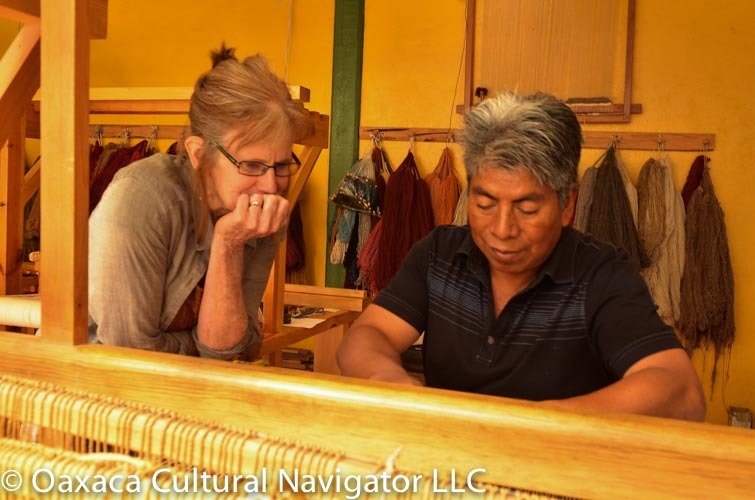 Oaxaca Cultural Navigator can arrange and schedule intensive tapestry weaving workshops and independent studio time that fits into your travel schedule. 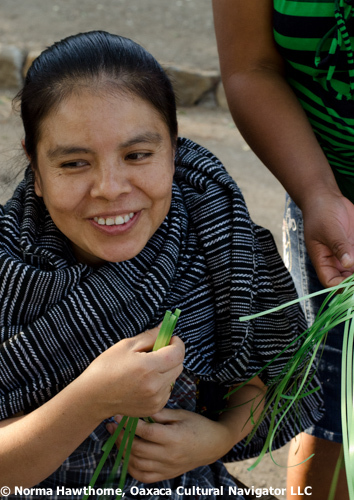 You learn from the Chavez Santiago family weavers in Teotitlan del Valle, Oaxaca, Mexico, with private or semi-private sessions. 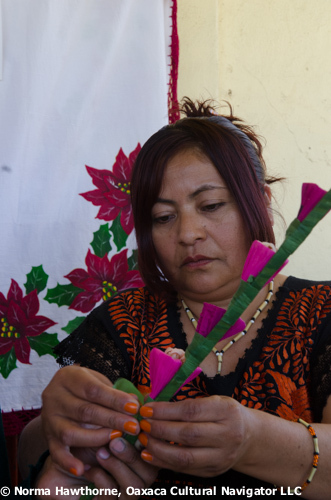 We are happy to offer you this opportunity to come to Teotitlan del Valle to learn from one of the most accomplished master weavers of the village. The workshop can be scheduled as a private experience to suit your schedule. Studio residencies are flexible and can be scheduled for as long as you wish to stay — one day, several days or several months. 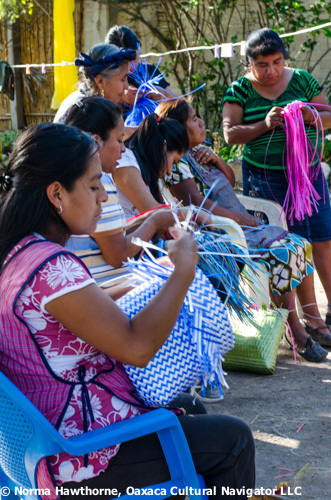 This includes independent time at your own dedicated loom to work on your own projects. 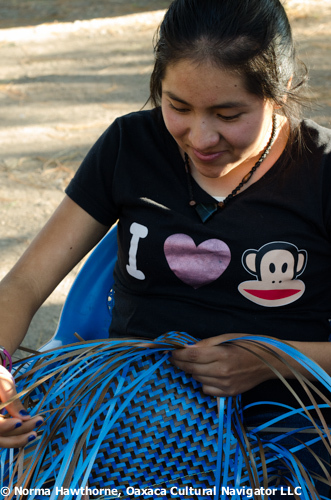 Weaving Workshop: Intensive beginner to intermediate level 4-day workshop at $585 USD per person. This includes all wool and 4-6 hours of instruction daily. At the end of the workshop you will have completed a tapestry sampler about the size of a pillow cover or small wall-hanging. You will make your own lodging, food and transportation arrangements. 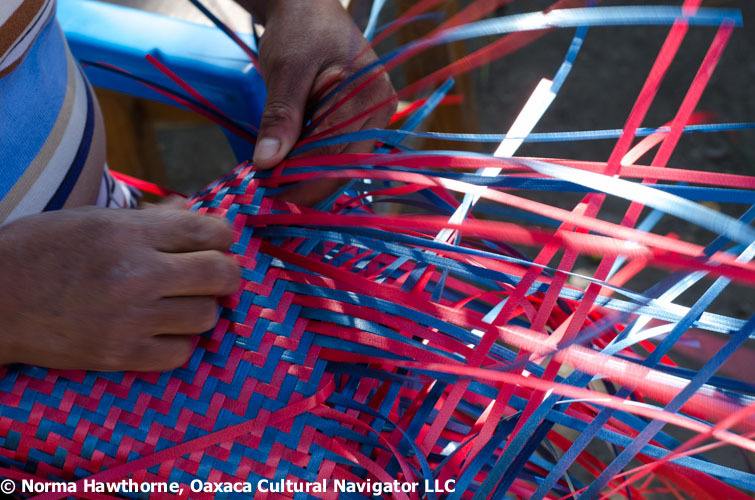 Note: Weaving workshop may overlap with other participants. 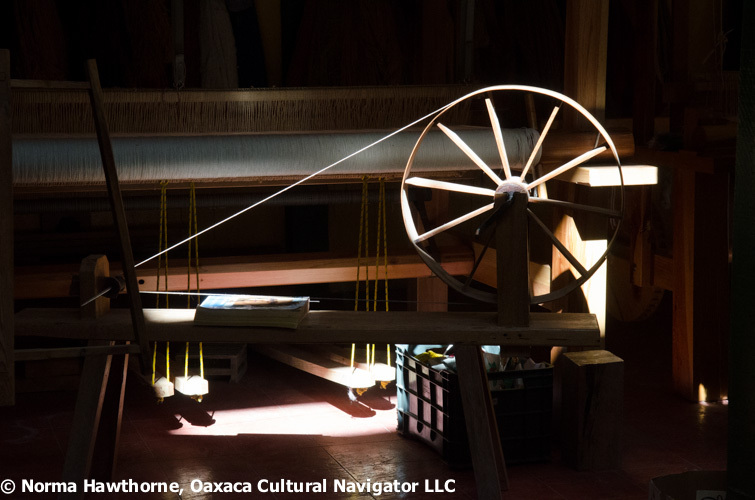 Optional: We can make all-inclusive arrangements for you when you register for Tapestry Weaving Workshop: Dancing on the Loom. Studio Time: Up to six-hours a day of studio time in the workshop at a dedicated loom. The cost is $100 a day. 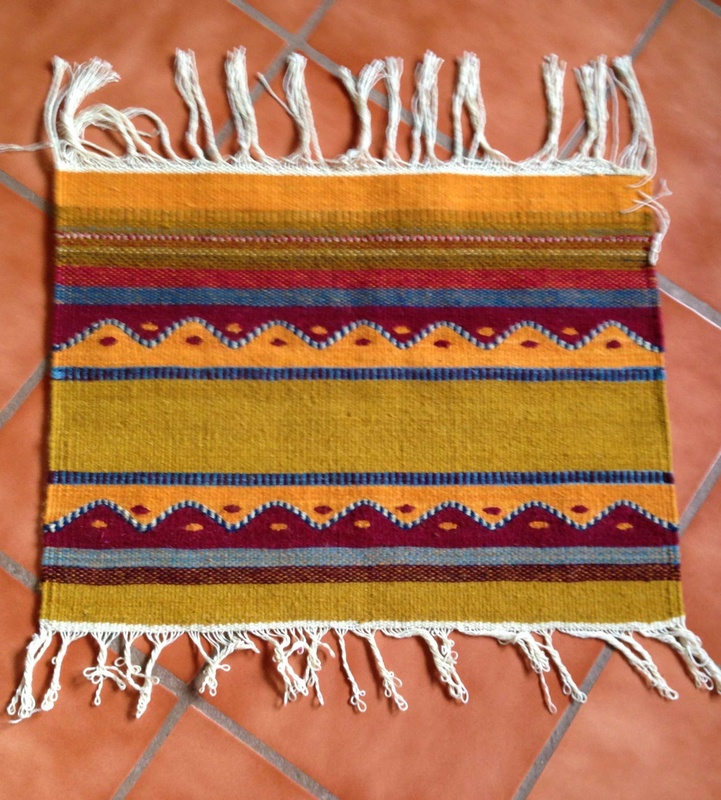 This includes naturally dyed wool, plus coaching and instruction to weave more complex designs. Note: Studio time may overlap with other participants. Long-Term Residencies: If you would like to stay longer than one-week, contact us for special pricing. Materials/Yarn for Purchase: You may purchase additional naturally dyed locally sourced, hand-spun churro wool directly from the family. 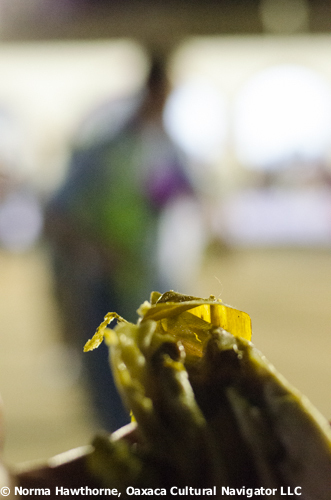 The cost is $20 USD for 100 grams or 260 pesos for 100 grams. 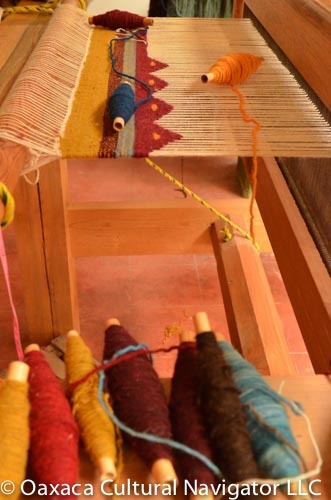 You can bypass the Intensive 5-day Weaving Workshop and go directly to studio time IF you are an experienced tapestry weaver or IF you have taken the beginner-intermediate workshop from the family at another time. 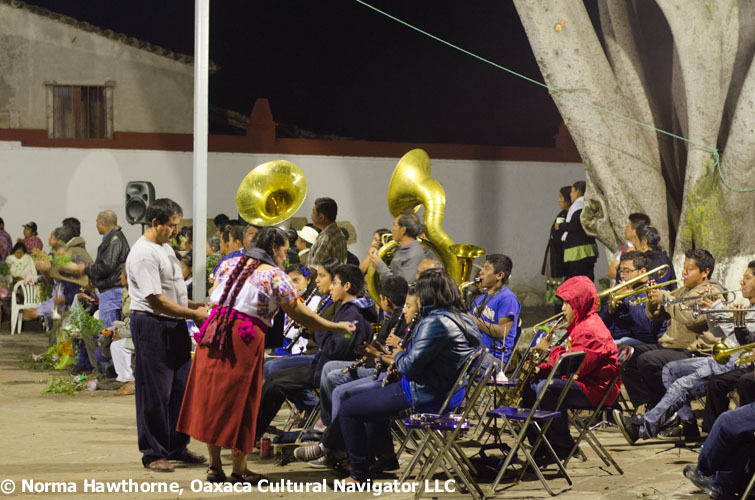 If you are interested in making these arrangements, please contact Norma Hawthorne at Oaxaca Cultural Navigator. We can set up the studio residency for as many days or weeks as you wish. 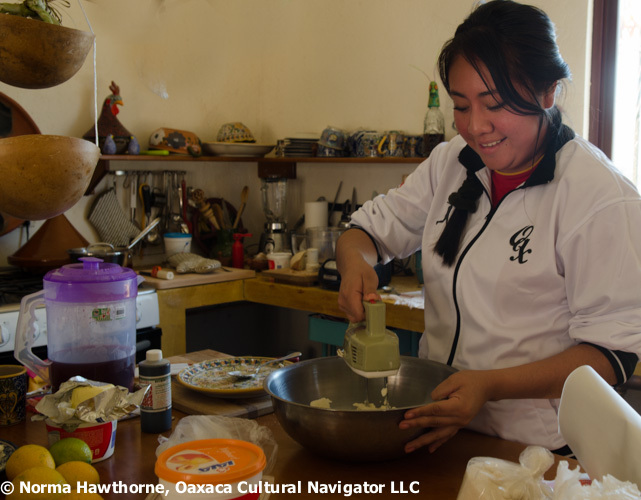 You would make all payments to reserve the workshop and studio arrangements with Oaxaca Cultural Navigator. We will send you a PayPal invoice for 1/2 the total cost with the remaining amount due 45 days before the workshop/residency begins. You would need to specify the dates you prefer for the workshop and/or when you want the residency.